ATF’s Detroit Field Division joined forces with the Detroit PD, along with other federal and local partners, to take a violent offender and his crew off the streets of Detroit through the Detroit One initiative. Twenty-seven year old Ramiah Jefferson a/k/a “Nightmare,” didn’t wake up fast enough and is now serving 30 years in federal prison for terrorizing a community. Jefferson, the leader of the Bounty Hunter Bloods, was convicted in August for racketeering conspiracy and possession of a firearm in furtherance of a crime of violence. He was sentenced on April 19 for directing the murders and attempted murders of rival street gang members, narcotics trafficking, furnishing guns and encouraging gang members to commit violent crimes. Bounty Hunter Bloods’ members used social media for self-promotion and communication. Members posted photographs on their personal social media sites highlighting their affiliation with the gang and their gang-related activity. In December 2010, Jefferson used Facebook to direct the murder of rival gang members. The post stated that the Bounty Hunters needed to “knock them down one by one” and that it was “huntin” season. Bounty Hunters also made up their own rap songs pledging their allegiance to the gang. Members would post the songs, videos, photographs and messages on social media sites to celebrate and project the violent culture of the gang. Evidence at trial demonstrated how members moved up in the organization by “putting in work,” which meant committing murders, robberies, carjackings, home invasions, drug dealing, and acts of violence against rival gang members. 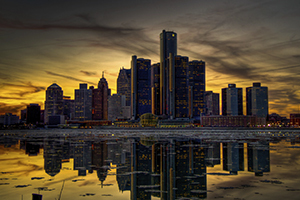 The Detroit One’s unified approach reduces violent crime by sharing information among federal, state and local law enforcement agencies and the community to identify and arrest those initiating violence. The results of the initiative are clear in the significant federal sentences, indictments, and convictions against those responsible for much of the violent crime in Detroit, and that Detroit has seen a reduction in homicides and violent crime. To read more, click the link https://www.atf.gov/detroit-field-division/pr/detroit-one-collaboration-leads-30-year-sentence-major-gang-leader-violent.